1) Around the 9.5 month mark, Sprout had a really big week. 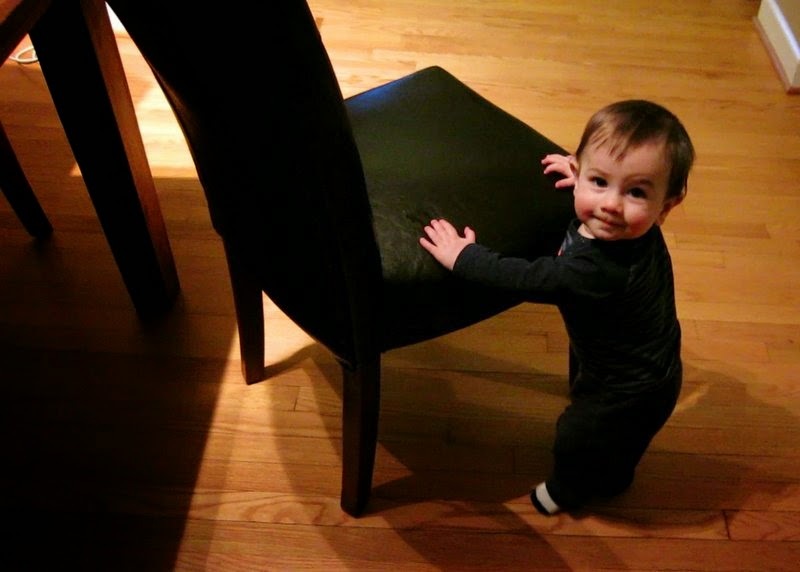 He *finally* got his first tooth and took his very first unassisted steps. Then, typically for him, he turbocharged walking. He went from his first tottering steps in the morning of February 1st to taking 4-6 steps unaided steps in the basement that evening. 2) Sprout is starting to use objects for their intended purposes. The other day he was playing with a an empty cup under the dinner table while I cleaned up in the kitchen. Suddenly, I heard a loud slurping noise, and when I went to look, saw the baby pretending to drink from the cup. 3) He's also taken to copying some gestures - for example, when I leave in the morning and both Fuzzy and Maya wave to me, Sprout waggles his fingers at me too. 4) Although this month Sprout started walking on his own, he still loves to push something in front of him. 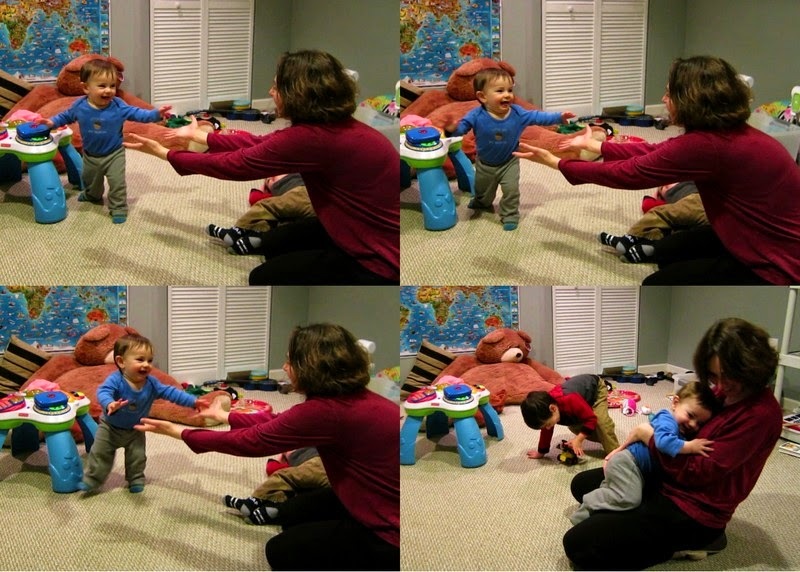 However, not something specifically designed for this task like a walker toy - no, he likes to find a box, a foot stool, or a really heavy chair, and then push those in front of him as he toddles around. 5) He's been doing a lot of tongue waggling recently, and like his brother at this age, is making a really adorable burbling noise - ablalblahlah, and so on. Periodically he will wake up in the middle of the night and talk to me like this for 5 or 10 minutes, at which point it is less cute, but still charming enough that I don't want to put him down. 6) Towards the end of the month, Sprout started points at things. Well, sort of pointing. He tends to keep his arm at a 45 degree angle, such that we keep guessing like so: "...that's...a tree...another tree...a...streetlight...possibly a cloud...likely a power line?" 7) The baby loves his big brother, and especially his hair. Whenever they are in the bath together, he practically lunges at Fuzzy, and grabs at his hair. Understandably, Fuzzy is a little disgruntled at this, and will quite indignantly let me know: "Mama! Tell Spout to be gentle with me!"